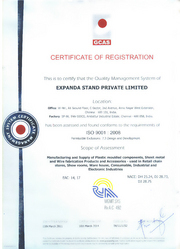 Expanda Stand Private Limited, Chennai. With more than a decade of experience in setting up retail chain store across India, Expanda Stand Private Limited has grown to become India’s leading supplier of retail store fixtures with its innovative product design and production capabilities. Our sincere thanks to customers like you, who keep supporting us by giving us valuable feedbacks and suggestions about our products and services, thereby our business grows year after year. Expanda Stand Private Limited has been serving India’s major retailers with its unique retail display solution since 1999. The promoter, Mr. M Mahadevareddy who was also a part of Indian Space Research Organization is a technocrat with over three decades of experience in the field of manufacturing of engineering products and also in reverse engineering. We have sourced the best machines and tools available in the international market to produce Retail store fixtures, viz. supermarket racks, hypermarket racks, Fruits & vegetable racks, Checkout counters etc… All our products are produced from automatic shelving production line which selects the necessary tools based on the drawings fed to the machine. Automation takes place from coil stage to finished produce, hence high quality with repeatability and reliability. Our engineers are also equipped with tools that enable us to test the quality of finished product. Our project management team includes engineers and project coordinators who can effectively plan every phase of your project from concept to commissioning so that you will be able to focus on your store’s grand opening and inventory management. As a part of total solution for supply of retail store fixtures, we offer store planning and design. The most important and crucial factor that determines the shelf life of any shelving system is the installation. Also installation being the final stage of your project, we understand how important it is to maintain your state of mind in peace. We also take up installation for our shelving system to make it a hassle-free experience. We are majorly looking inquiries from Chennai, Hyderabad, Bengaluru, Vijaywada, Vishakapatnam, Ponidcherry, Gulbarga, Tamil Nadu and South India. Manufacturing, Trading and Exporter of Retail Display Products. The workforce of any organization plays a critical role in its survival in this cutthroat business environment. We are privileged to have with us a dedicated and proficient team of professionals who are devoted to provide our clients with high grade modular display products and effective material handling and storage solutions. Our team is being provided with appropriate training and regular updates from the market to make them highly competitive in their respective domain of work.